The English have an expression, “love you to bits!” It’s a hyperbole that expresses the extremes of one’s love. There’s no general agreement on its etymology. Some would say that it literally refers to the person experiencing the fullness of the emotion to the point of exploding into small pieces. Interesting though dramatic! On a more positive note, there would be others who would suggest that loving someone to bits means that you love them so much that loving them in their entirety is not enough, you need more to love and therefore start breaking them down into many bits and pieces so you can devote your love to each piece individually thus increasing the focus and passion. I guess that both explanations may be inadequate to express fully the profound depth of such kind of love. But then again in any language love makes little sense to any of us. I guess that more often than not the emphasis is not placed on loving the other to bits but the provisional “but” that sits at the end of the statement. Today Jesus confesses and displays to his disciples and by extension to all of us, a profound love, an unconditional love, a love without BUT’s! The story of the washing of feet at the Last Supper in today’s gospel is prefaced by St John’s poignant note regarding Jesus’ love, “He had always loved those who were his in the world, but now he showed how perfect his love was,” or in some translations, “he loved them to the end.” In the case of Jesus’ love of his disciples and all of us, it was not just loving them to bits (and pieces) but loving them to the end! He showed how perfect his love was. He loved them to the end. This simple statement is loaded with significance. “To love to the end” is to love freely, without reserve or limit, and without flaw or failure. This is love in its essence, love in its consummate blossom and fruit, love in its ultimate and final perfection. It is love to the uttermost, to the fullest extent, to the extent of enduring the suffering and death on the Cross. Loving to the end reveals the depth of Christ’s love for us. We know the depth of someone’s love for us by what it costs him. In the case of Christ, it will cost him His life. Though the disciples gave upon on Him, He never gave up on them. Though they stopped thinking about Him, and were only thinking of themselves, He never stopped thinking of them. That is the first thing about this love. It is not offended by our failures. He does not withdraw His love because we make mistakes. We may often disappoint Him, we may often fail Him, we may often grieve His heart, but He goes on loving us. He loves us unto the uttermost, right to the very end. But to love someone “to the end” doesn’t only mean to the end of one’s life. In the case of Jesus it points to a love that will never end. Jesus will never stop loving His own. It isn’t a love that comes and goes, that is here today and gone tomorrow. “To the end” means a love that reaches to the fullest extent, that goes beyond any human norm of sacrifice or standard of giving. Loving “to the end” would mean the Jesus was prepared to pour out the cup of his life as a libation for the atonement of our sins. Loving us to the end would mean that not even death would be able to rob us of this great gift. On Easter, we will see love’s victory over death and sin. 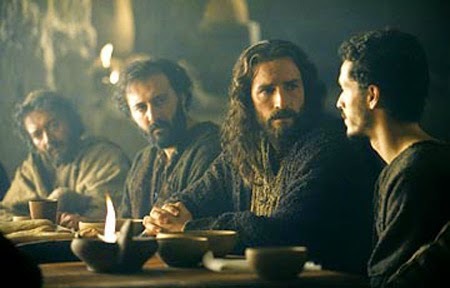 This, then, is the theme of John's portrayal of the last supper. It is a love (agape) feast in which Jesus exemplifies the sacrificial love he expects from his disciples in his washing of their feet. He sets for them a pattern of service, of humility, of bearing the burdens of another. At the cross he will institute a new Christian family by commanding two persons not related by blood (his mother and the beloved disciple) to care for each and relate as family because of their bond through him. On this night, he commands that those who would be his followers to serve each other for his sake. And that is why on the night when he was betrayed, on the night before he was led to Calvary, Christ reveals to us the furthest extent of his love for us. Tomorrow, he does this by ascending the throne of the cross, but today he gives us an example and a new commandment to do likewise. “I give you a new commandment: love one another just as I have loved you.” The commandment isn’t new; but the extent of love, the standard of love is new. Jesus did not replace or change the commandment, “Love your neighbour, as you love yourself.” Rather, he filled it out and gave it the best illustration ever – not just by washing the feet of his disciples, but more importantly by “loving them to the end”, even to dying on the cross. The model of true love is Jesus Christ. More specifically, the model of true love is Jesus Christ crucified. “I give you a new commandment: love one another just as I have loved you.” This is the standard set by Jesus who not just merely loved, but showed how perfect his love was, who was prepared to love them to the end. This commandment is at the heart of our celebrations this evening. This commandment undergirds both the celebration of the Eucharist as well as the ritual of washing of feet. Every Mass is a celebration of this special love of Jesus giving himself for us on the cross. This commandment is the reason why we call this day, Maundy Thursday. “Maundy” comes from the Latin word for “mandate”, which simply means an order or command. Everything else hinges on this. Jesus loves those who are his. The reason he came to this earth was love. The reason he gathered his disciples to him was love. The reason he endured the agony of the coming day was love. The reason he died the vilest death was love. And finally it was love that broke the chains of Hades and defeated our great enemies, death, sin and the Devil, in one single swoop. Today, Jesus shows us how love looks like. It’s not worn as a badge or as a slogan emblazoned on our t-shirt. It’s not sweet platitudes or found in boxes of chocolates or large bouquets of roses. There is nothing warm or fuzzy, nice or sentimental about it. So, what does love look like? It looks like service. It means getting our hands dirty, humbling ourselves before the other, stooping to the lowest position, and finally embracing the cross. It looks like the cross. To love means to follow Christ, and this is what he did: “And being found in human form, he humbled himself by becoming obedient to the point of death, even death on a cross.” (Phil. 2:8) That’s how love should look like. You know, it is so easy to talk about love, to pretend to love, to use the language of love, to sing hymns about love, and it can all be sentimental. Yes, Jesus did not come and love us to bits. He did more, he loved us with a perfect love, he loved us to the end. He loved us and laid down his life for us. The Love of Christ is never sentimental, it is sacrificial. And this is the love with which He loved us to the end.